Let's check out science explains how much sleep you really need. You've probably heard a lot about your biological clock and how respecting your sleep cycle can have significant health benefits. People usually think that seven to eight hours of sleep is enough but that's not always the case. Sleep is an integral part of our lives. If a person sleeps eight hours a day they spend one-third of their life in this state. If they live for 75 years this equals 25 years or 9125 days spent asleep. Wow, it's clear that this process is vital for normal rest and recovery. This may surprise you but the number of hours you need to enjoy proper sleep depends on your age. But we'll speak about this a bit later. First, let's discuss what happens when you experience a lack of sleep. Lack of sleep, many of us wait for the weekend to get a good night's rest but you shouldn't neglect sleep on the weekdays. Set a time for wind. You'll stop viewing the latest viral video online. This will greatly benefit your overall condition. First of all being sleep-deprived negatively affects the quality of future bouts of sleep. Secondly, a lack of sleep has a detrimental effect on your health. Not getting enough sleep weakens your immune system and can have serious consequences. A review based on 16 studies concluded that people who sleep less than six to eight hours a day have a 12 percent higher risk of premature death than those who sleep more than eight hours. If you constantly feel sleepy are easily irritated, feel exhausted during the day or offered yard. You must likely suffer from sleep deprivation. If you believe in magic methods like coffee or other stimulants to keep you awake. Don't get your hopes up nothing will help you deal with this problem. As your body's need for rest will be stronger not getting enough sleep also increases the risk of developing the following problems and diseases exhaustion, depression, changes in hormone function, cardiovascular diseases, visual impairment diabetes. Your emotional state can also be affected by a lack of sleep. You might be impatient or irritable or prone to sudden mood swings. Your decision-making abilities may become compromised. In the worst cases of severe sleep deprivation, people even start having visual and auditory hallucinations. A lack of sleep or prolonged periods of time is likely to trigger manias in people suffering from manic depression. In addition, people who don't sleep enough can experience periods of microsleep during the day. During this time, they fall asleep for a couple of seconds or minutes without realizing it. Microsleep can be extremely dangerous or even fatal if a person is driving. What is more, people experiencing micro sleep tend to get injured when they fall or trip over. Something on top of all this, bad sleep negatively affects your body and appearance. As a result weight gain, circles under the eyes, pallor, and a poor complexion become a real problem. Prolonged lack of sleep also leads to a lack of concentration. A decrease in everyday efficiency and premature aging age and sleep age affects more than your health and bodily functions. Scientists have established the connection between age and the required number of hours a person needs to have a good night's sleep. Newborns 0 to 3 months old need about 14 to 17 hours of sleep daily. Infants who are 4 to 11 months old should sleep for 12 to 15 hours. If you're the parent of a 1 or 2-year-old toddler make sure they sleep for no less than 11 to 14 hours every day. 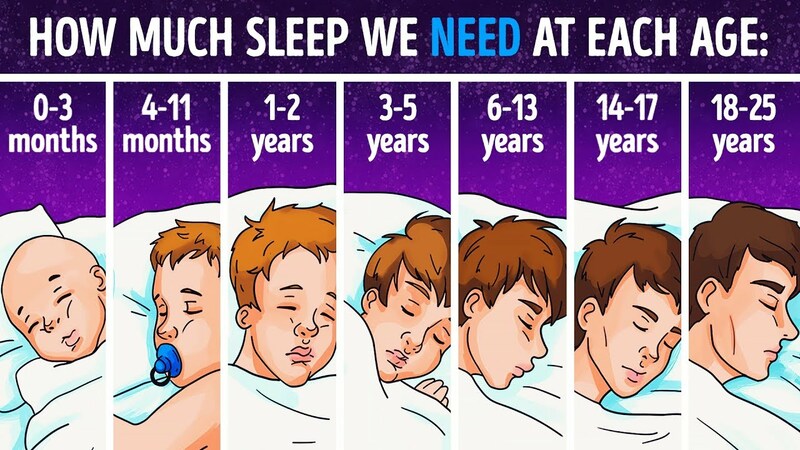 Preschoolers 3 to 5 years old should sleep for 10 to 13 hours daily. Kids from 6 to 13 years old still need more sleep than adults 9 to 11 hours. 14 to 17-year-old teenagers should sleep for 8 to 10 hours. Young adults of 18 to 25 years old needlessly just 7 to 9 hours every day. The same can be said about adults between 26 and 64 years of age 7 to 9 hours are enough for them to rest. Elderly people older than 65 sleep even less 7 to 8 hours a day. So, you can see that the older a person is the smaller amount of sleep recovery they need. Babies up to 3 months old require the largest amount of sleep. Children and teenagers under 18 years old should sleep more than eight hours a night to stay healthy. After that, the required amount of sleep reduces significantly and changes only after a person reaches 65 years of age. may even feel the need to have short naps during the day. Sleep improvement, it's important to pay close attention to the quality and duration of your sleep. Bad sleep can lead to a deterioration of your health. Use the following tips to help you get enough sleep and feel refreshed every day. Keep your days and nights separate. It's important to remember that people should stay awake during the day and sleep at night. If you break this scheme then you're likely to have sleep problems. A fixed schedule will regulate your body clock. This is also called Circadian Rhythms. absolutely, must smoke a cigarette or drink a cup of coffee in the evening. eat anything in the two hours before bedtime. Avoid spicy meals and heavy foods. They may cause indigestion or discomfort. Create a cozy and comfortable atmosphere in your bedroom. The temperature in the room shouldn't be higher than 75 degrees Fahrenheit. Make sure there's no light getting into the room from outside or from any source of light inside the house. Keep your bedroom as quiet as possible. As noise prevent you from getting quality rest. Choose a comfortable bed and quality bedding. Check that your mattress and pillow are comfortable enough. A short walk in the fresh air before going to bed will help you fall asleep more quickly. Try not to use gadgets before going to bed and turn off electrical appliances at night. Social media will stimulate your brain and that's exactly what you don't need before falling asleep. Pay attention to physical activity and relaxation techniques. Your body needs to switch to sleep mode. Which is why you should start to wind down one or two hours before going to bed. This way your body and your brain will realize it's time to rest. You can even invent a bedtime ritual that will help you relax and get rid of stress accumulated during the day. It could be taking a warm bath, reading a book or meditating. Avoid nap, if you have problems with sleep. Although, they are a popular and effective way to charge your battery during the day. They may keep you from falling asleep at night. If you feel that you can't survive without a nap and your eyes are closing. Getting enough sleep isn't that complicated! You can improve your sleep by doing these simple actions in return you'll be cheerful and healthy. So, how many hours of sleep do you typically need? How do you relax before going to bed?